Isn't she lovely? She's a little whiny right now, but we're hoping that's just a bit of separation anxiety. She's used to being on this huge ranch with like 30 other beagles. We just got her today and she's about 7 weeks old. She's so tiny! And she really has the cutest little personality already. 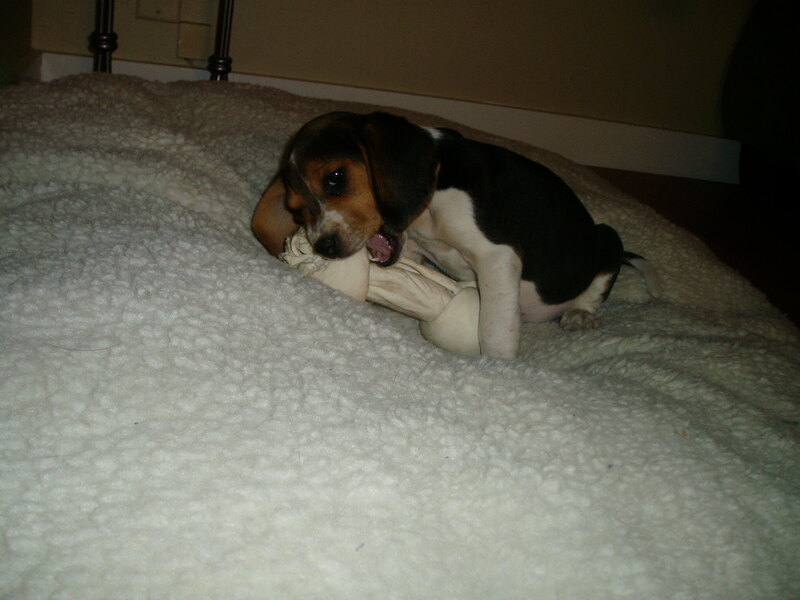 We bought these little rawhide chewies for her, but Chloe stole it from her. So check her out below. She decided to tackle the HUGE rawhide chewy that's about as big as she is! It really was adorable. You really should come by and see her. You know, if you're friends of ours. If you're just some random person, please don't come to our house, mmkay? AWWWWWWWW!!! Chloe has a baby SISTER! 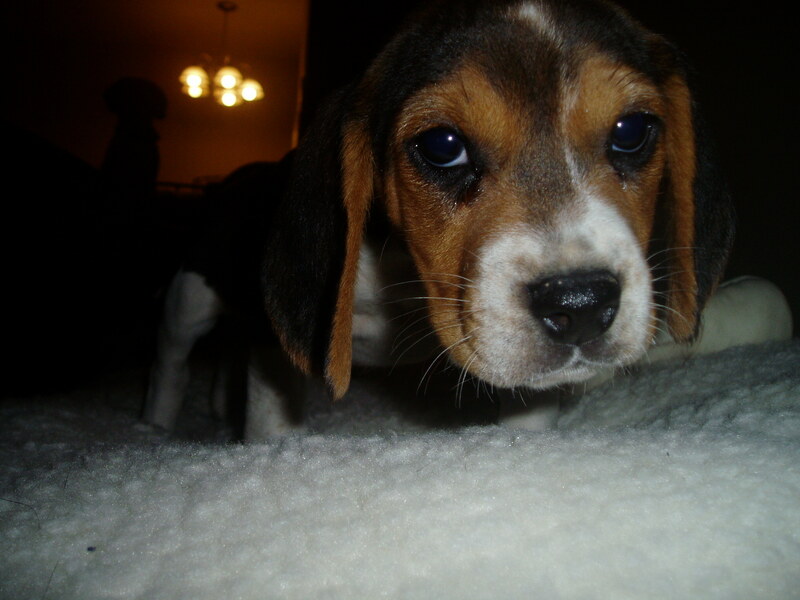 Okay seriously, as if I needed more reason to come to your house you get ANOTHER beagle puppy. I have to admit that’s a pretty cute puppy. How do you resist those puppy dog eyes? I don't. That's why she had to come home with us! I too, must (grudgingly) admit: That is a very, very cute puppy. I’m there. Leave Tuesday open. She’s used to being on this huge ranch with like 30 other beagles. The Daisy Hill Puppy Farm? Beagle Barn, actually. They’re in a middle-of-nowhere called Beryl, UT. It’s about 45 minutes west of Cedar City. Ah, the Daisy Hill Puppy Farm. Where the best beagles come from. She’s adorable, and my heart melted a bit just lookin’ at the photos. Oh my goodness, she is C-U-T-E!!!! She is very cute. Have you introduced her to the coffee table yet? She seems to be smart enough to not try that stunt. She does, however, take a bite at pretty much everything else. Thankfully, Annabelle is too small to do much damage, so we just tell her “bad chewie” and pull her away from whatever it is she’s got her maw on. Most of her time is spent chewing on Chloe and we don’t really mind that much at all. I won’t speak for Chloe. We tell our dog Chewie “bad Chewie” all the time. That’s good that she seems to know what to chew and what not to. Our new puppies still have yet to master that. I’m expecting to wake up one morning and one of them be missing a leg. They are THAT aggressive. OK everyone. The Daisy Hill Puppy Farm was only cute when “Max” sent his letter to “Munchie”. It’s on my testimonial page. Next story I hope you're hungry.